To Sum It Up: Jacob and his group of peculiar friends are forced to flee the island they once considered their sanctuary. They must now journey all the way to London in order to save Miss Peregrine and possibly the peculiar world. 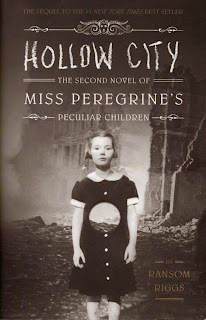 Review: I suppose the only way to begin is by complaining about how long I have been waiting for the sequel to the phenomenal Miss Peregrine's Home for Peculiar Children. But damn was it worth the wait!!! *excited seal clapping and fangirl squealing* I guess now is as good a time as any to warn you that this review will consist mostly of me gushing about how much I loved this book. For your sake, I will do my best to put my insurmountable love for Hollow City into real words and possibly even sentences. I am often quite wary of sequels as they all too often disappoint me. Sometimes it's really hard to reattach to the characters and find interest in the new or even continuing story line. I am very happy to say that this was not the case at all here. I was very relieved that we picked up exactly where the first one had left off. Everything I enjoyed in the first installment was carried into the sequel and improved upon. The photographs were just as creepy and fascinating. The "new" setting was even more exciting than the last, and the story line was phenomenal. The second book added layer upon layer of richness to the story that so masterfully began in the previous book. Also, the character development was very well done and not in any way forced or rushed. With so many intricate characters, it can be hard to give each one his or her fair share of attention. While I was quite aware that there were numerous characters, they were so well written that I never felt overwhelmed by their sheer number. I will be counting down the days until the next book comes out. I have absolutely no doubt that I will enjoy it as much—if not more than I have this one. All in All: All I have to say is: YOU MUST READ THIS SERIES!!! Based off your review i'm going to go out on a limb and you like this series and i must read it. :D Any series that makes you count the days for the next book is one worth checking out. I'm in. Matt @ JC's Book Haven. I am adding this series to my TBR..I keep thinking it looks fun! That's great to hear! It is loads of fun and I hope you enjoy it! I remember this first book coming out ages ago and I was a little wary after a few mixed reviews, and I think I decided it was not for me. However now I definitely think I need to add it to my to-read list. Glad you enjoyed the sequel so much!